Home > Throat Surgeries > What is Tracheostomy Formation? A tracheostomy (or tracheotomy) may be constructed as a preventative or prophylactic measure, but may also be needed in an emergency situation. A tracheostomy is a hole that is purposely made in the neck to aid breathing. Under surgical conditions (unless it is a dire emergency), the surgeon dissects through the tissues until the trachea is reached. This is opened very carefully until a clear passageway has been created. Into the hole is inserted a tube that can be fixed in place whose purpose is to keep the passage open, allowing for inhalation and exhalation. A tracheostomy is made to help breathing. This may mean the natural airway is obstructed or seriously damaged preventing normal breathing being achieved, thus the oxygen level will drop. It may also be used to help clear the airway and let it rest following a trauma to the throat or mouth or in the incidence of head and neck tumours among others. Although in most cases a patient will already have problems with his or her breathing, hence the need for the tracheostomy, a general anaesthetic may be given, or a combination of local anaesthetic and sedation depending on the patient and their current heath status. The airway is maintained by the anaesthetist and the breathing apparatus used, until the surgeon is confident that the trachea is sufficiently cleared and ready to open. When the trachea is opened the airway is inspected and if suitable, a tracheostomy tube is inserted and the anaesthetic breathing apparatus is attached. From this point on, or until the medical team is happy for the procedure to be reversed, the patient will breathe through this tube and not the nose and mouth as normal. In most cases the tracheostomy tube will need changing a few days after surgery as there may be initial swelling which when subsided a smaller size may be needed. Is it A Dangerous Procedure? Although many tracheostomy formations are carried out every year, the procedure does not come without risk, and equally the follow up care and maintenance of the tracheostomy is important in its success. In a small number of cases, there is a risk of bleeding as there is with many types of surgery, but this is very serious when performing a tracheostomy as the blood can collect in the trachea or clot and compress the airway following the surgery.There is also the risk of surgical infection along with the potential to damage the larynx which sits very closely to the area that is being operated upon. Following surgery, it is vital that tracheostomy tube remains free from obstruction; this includes foreign bodies and mucous collection. It should be cleaned every day or when mucous is starting to collect. 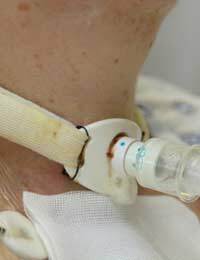 A tracheostomy can save life or be used to prolong it and give the patient more comfort. It is a serious procedure that is not without risk, but when it has settled, can significantly improve future prospects and quality of life for the sufferer.